There is a lot of footwear that will suffice when hiking around in the flatlands, but when you hit the mountains, that’s a different story, so you don’t want to scrimp on boots. Not only will they be uncomfortable, but they can also be dangerous. If you hiking on treacherous trails you can slip and fall to your demise. There are a lot of cheap hiking boots that look good in the store. They may even feel comfortable in the store, but when you get up on a treacherous trail you don’t want just comfort in your boots, you need practicality. So, the first thing to look for when buying a pair of boots is to get good fitting boots. If they feel a little weird in the store, they’re not going to get better in the mountains. You don’t want your feet slipping around inside the boot or you’ll be unstable, plus you’ll more than likely get blisters, not recommended. Here’s another tip, wear good boot socks. Good socks will protect your feet as well. When you go to buy boots, wear your hiking socks or your boots may be too tight when you do. Personally, I like Carolina Hosiery socks, especially their Browning Cupron sock. In the summer and into early fall, I like to wear lightweight canvas hiking boots. A few years ago I started wearing Irish Setter boots and have now fallen in love with them. All Irish Setter’s are sturdy, well-made boots. I can’t count the models and pairs I have collected to date. Recently, Irish Setter just came out with a new boot they call the Shed Tracker. They have a low top version and a 6-inch version. I like added ankle support, so I went with their 6-inch model. They are lightweight, have good traction and dry out fast if/when they get wet. Over the last few years, I have learned a lot about what to look for in boots to ensure that they are well constructed. Important features that go into making a good boot include the sewing job, and the sturdiness and stability of the sole, both Irish Setter do well. Additionally, I look for a well-designed sole with good traction. I live in Idaho, so I hunt some rough country. In a week of elk hunting, I’ll slip 6–8 times with 1–2 hard falls. In some places, if you fall you’ll get hurt or maybe even killed. When I’m backpacking, I sure don’t want to slip off a trail with a big pack. ; you would get tumbling down the mountain and be in bad shape by the time you hit bottom. As we speak, the snows are melting and the backcountry is about to open, so I’m sure a lot of you will be looking at a pair of light weight canvas hiking boots. 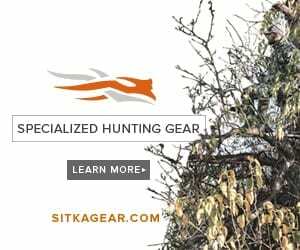 Look no further; check out a pair of Shed Tracker boots from Irish Setter. I think you’ll be happy.